Well, another week (and weekend) has passed, and I’ve got a lot of “not much” to show for it! Been busy at work playing catchup – that’s when you’re BEEN busy, but now you’re not quite so much, so you grab the opportunity to catch up on stuff that should have gotten done long before now. I did finally get a set of valances done for the front entry – I’ve spent the past few weeks painting off and on, and now that that’s mostly done, well, it was time to do something about the windows. It was echo-y in there! As you’ll recall, I’d spent HOURS and HOURS on a set of Roman blinds for those very same windows not even two years ago, and then, when we had the bathroom put in, well, that just screwed up everything – I had to take the blinds down in order to have the windows moved (and removed), and, well, I realized then that I didn’t really love them enough to want to put them back up. 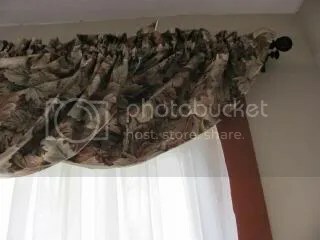 I had some older drapes, though, that I LOVED, so I re-purposed them into pretty valances. I did a little experimenting this weekend – I made a small batch of hollandaise sauce for eggs benedict for Sunday breakfast. Would you believe I’ve never made eggs benedict? I’ve never-ever made from-scratch hollandaise, either, so there’s that too. Well, as it happens, The Jar is a big fan of eggs benedict. I’m not sure if it was the buttery sauce or the leftover egg yolk on the plates, but he was a dish-licking fool! 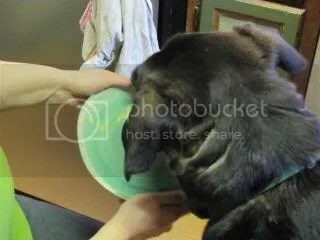 Does anyone else let your dog help “rinse” the dishes? And once again, it’s time for the weekly menu plan. We are (still!) working very hard to get the freezers emptied – while it’s been GREAT for the grocery budget, it’s starting to feel a little un-inspired some days. 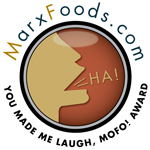 I mean, there’s probably a reason some of that stuff is still in the freezer, you know? Besides the fact that it’s been forgotten, that is. Monday – With the temperature forcasted to reach 70 (yay!) we’re of course going to fire up the grill. And I believe this grilled tilapia with parmesan polenta should finish off our tilapia stash. I think. Tuesday – We’ve still got some of Peeps’s pastrami safely vacuum-sealed in the freezer, so we’ll break some of that out. I even made a batch of potato salad this weekend that’ll go nicely. Spring is HERE people! Wednesday – Remember how last week, we had enchiladas with the last of the green enchilada sauce we’d stashed in the freezer? Well, it was still more sauce then we were able to use in one meal, so we used it for some soup. It’s super simple – saute an onion, and add the rest of the enchilada filling (smoked pork mixed with sauce), a quart of chicken stock, a couple of cups of cooked pinto beans, and a good couple of handfuls of frozen corn. It should be fantastic with a little cheese quesadilla on the side. . .
Thursday -The last of the Cincinnati chili is coming out of the freezer – we prefer to do something easy on Thursdays. After all, it’s getting toward the end of the work week, and we’re tired. I don’t know about anyone else, but by Thursday evening, I’m not up to too much effort! Friday – Of course, there’s not a lot of effort involved (for me, anyway) on pizza night – Peeps does most of the work, while I try to keep the dog out from under his feet. Seems like a fair deal, right? All of our dogs are/were assistant plate cleaners. And they found dishes which had beef gravy to be their favorite (although bacon and eggs are right up there too). As our dogs aged, we found that they couldn’t clean every plate. But it was still good to give our boys a treat every now and then. 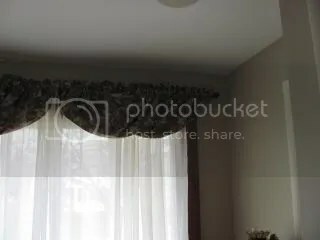 I love the way you repurpose things around you and the valance looks great! Yes, it is certainly coming together. Hope you continue to “get caught up” and that it stays that for awhile. Have a good week. Such fun memories….I had a pair of curtains that I reused several times and was sad when they finally just fell apart! And, yes, those practices did get cold, baseball and football. I haven’t heard much about The Boy lately or mom in law. I miss the stories. Enjoy your new room. Looking good.